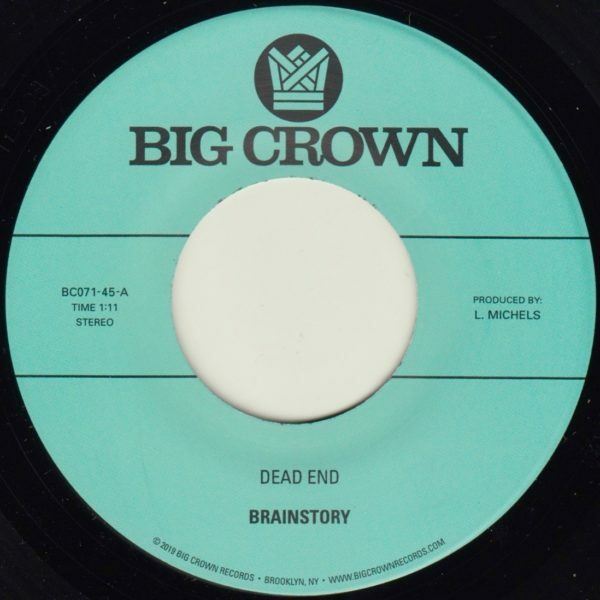 Big Crown is proud the present the debut single from the one of the newest acts on the roster; Brainstory. Brainstory is a tale of brothers bounded by blood, by fate, and a small town with nothing to do. Born and bred in Rialto, CA, the trio is made up of two brothers, Kevin & Tony Martin, and drummer Eric Hagstrom. Their music is a mix of jazz, funk, and psyche- delia shrouded in a cloud of weed smoke and California soul. Their entire debut album is produced by Leon Michels, so you take the Cali sunshine and mix it with Michels NYC aesthetic and you get a killer record. Here’s the first two songs. The A side “Dead End” is a sublime slow burner about trying to let go of a person and trying to let go of parts of yourself that are dying with that relationship. In the words of Kevin, “ It’s kind of like confronting death, but through relationships and coming to terms with who you are in the mirror of another person.” With Kevin’s sublime falsetto floating atop Tony and Eric’s unflappable and unmistakable backbeat, this tune is sure to become a favorite with the ballad heads, the low-rid- ers, the slowie collectors, and anyone who’s cord is not unplugged.